Have you heard? Drones are now being used everyday — and you can make money with drones! If you’re anything like me and have an entrepreneurial streak running through your blood, you’re probably wondering how you can get in on the fun. Drones are quickly becoming more accessible and more affordable — and they’re fun to fly. Here’s a good read: The History Of Drones. Ultimately, there’s good money to be made if you’re going to buy a drone, but you’ll want to be smart about using it. The ways that drones are being used now. How to choose the best drone with camera capabilities. Some cool ideas for making money with your drone. Great tips for beating your competition! The value of the drone is quickly becoming recognized in more and more applications. Even corporations like Amazon have developed ways to use drones as part of their day-to-day business model. Law enforcement agencies, construction companies, and event organizers have also recognized the benefits of using drones at work. One of the most popular uses for drones these days is for aerial photography. Until recently, shooting aerial photographs or videos meant the expense of hiring a helicopter. When you consider that a drone costing around $1,000 can produce images of equivalent quality — it’s cheaper to use a drone for sure! You can make some extra cash (or maybe even make a career of it) by flying drones, recording videos, and then selling those videos (or the information contained in those videos) to niche markets. Now is definitely a great time for entrepreneurs to embrace this new technology. Inspect and survey buildings. Inspecting roofs and hard-to-reach parts of buildings can be very expensive. A high-quality photograph or short video sequence may be all that’s needed to assess damage to a building or indicate work required. Create advertising and marketing collateral. Think along the lines of real estate, hotels, and golf courses. Photographs of real estate from the air are far more impressive than those shot at ground level. Shooting from a drone allows a property to be seen in its surroundings, and can show prospective buyers and visitors the views they will see from windows and rooftops. Assess insurance claims. Rather than sending an insurance appraiser or loss consultant to the scene of a fire or flood, a drone can be engaged to do the work instead. Drones can stream live video from a location, as well as record photographs and video footage which can be valuable in determining the extent of the damage. Do surveillance and security work. Drones can provide aerial views of public events and stream live video footage for crowd control. Traffic monitoring, protecting animals against illegal hunting, and search & rescue are other growth areas for drones. Here are 20 ways entrepreneurs are making money with drone video. A remote pilot certificate is the official name for a drone license. With it, you can legally fly drones with the intention of making a profit. You can either sell the footage, deliver the goods, or find other creative ways to earn extra cash with a drone. Have a valid government-issued picture ID with your name, address, and signature. Take the FAA’s free online course (part 107 Small Unmanned Aircraft Systems (sUAS). Make an appointment to take the knowledge test at a test center near you. Pay $150 to the testing firm, study for, and pass the test. Apply for your Remote Pilot Certificate as an “applicant” (using the code from your successful test as proof). Complete a TSA background check. Print out a temporary Remote Pilot Certificate (while you wait for the real one to be delivered by mail). Register your drone (could also do this first), then start flying! Here’s a complete list of the FAA’s do’s and don’ts to follow when flying your drone. Considered high-end and equipped with the latest technology, professional drones (or Quadcopters) with longer flight times and advanced features will give you the ability to capture high quality aerial video and still photos. This makes a drone a great addition to your filming arsenal. You’ll want to research the type of drone that makes the most sense for what you hope to use it for. Auto-takeoff – With one tap, the drone will switch on its motors and rise to a pre-set height. It will then hover at that point — until you tell it where to go. Auto-return home – A drone remembers the exact spot it took off from (when GPS is available) — just tap a button to have it return back home. Waypoints – Set specific GPS coordinates (longitude and latitude) for various locations, and assign automatic actions for the drone to follow. Points of interest – Select a specific place or object, and the drone will continuously face it — no matter how you fly. 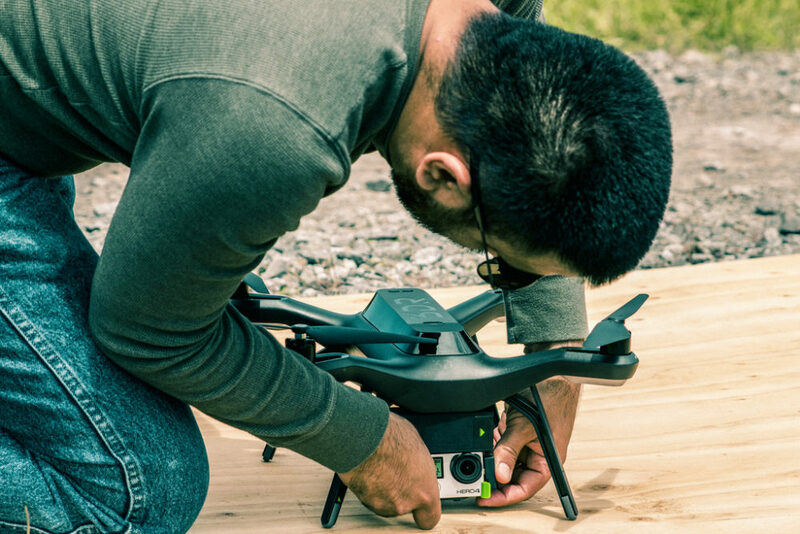 Fail safe – If the drone battery is running low or it loses its connection with the remote controller, the drone will automatically return to the takeoff point and land safely. Follow me – You can program the drone to act as your own personal, flying film crew. Looking for the best drone with camera and video capabilities? These are some of the top-rated professional drones with cameras . Consider a variety of industrial applications where you can use your drone. Find ways to provide a clear ROI and tangible benefit for your customers. In addition to collecting the data, become an expert in data analysis & post-production as well. It’s not the data that’s important, it’s what you can do with it. Rather than just providing your customers with aerial video footage, find ways to stitch the data together and then tell your client what they should do — based on what the data is telling you. Offer faster turnaround times and more responsive customer service. It’s not just about the product or service that you’re providing, it’s about the entire experience that your customer receives. If you can do things faster, more accurately, and more professionally than your competition, then who do you think will earn the most business and higher pay? Run a professional and safe operation. You need to have the right documentation, insurance, and operational procedures in place in order t0 put your customers’ minds at ease — so they’ll be able to trust that you know what you’re doing. There’s no better time like the present to start exploring money-making opportunities using drones. Once you have your drone license, the possibilities are endless!